I went to the Roseville Rockrollers show this weekend and got the honor of test driving a really sweet Fac-ette machine. Wow! So addictive! Yet another way to spend money on rocks! He was kind enough to donate a morganite to my cause. It apparently came from a chipped up commercial stone that he recut once, but didn't like it, so he sacrificed it to my learning. I was able to finish the pavilion in ~ 4 hours, and will be back in a few weeks to get the other side. Must have made all the rookie mistakes! Overcut the second tier and had to start over, then accidentally hit the stone on the edge of the 6" lap TWICE. So I had to start over three times. Meets are terrible, but the polish isn't bad and boy did I have a lot of fun. Don't know anything about faceting. The fun you had came shining through your post!!! You go, girl! Nice work. Looking forward to seeing the finished crown. Transferring can sometimes be something of a challenge. 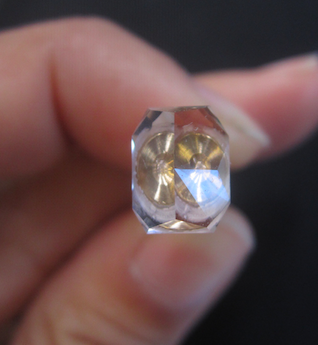 If you think cabbing is a money-magnet, wait until you take the plunge into faceting! But it's great fun and very satisfying when you finally see a finished stone come off the dop. You appear to have natural cutting skills. Your rough looks great too. Blue-green tourmaline is lovely. 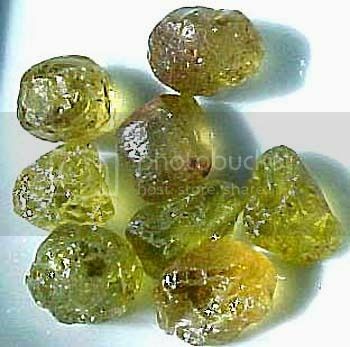 The yellow grossular garnets appear to me to be from Mali, otherwise known as Mali Garnet. The Mali material contains high R.I. andradite garnet that results in very brilliant stones if properly cut. Facetable yellow grossular also comes from East Africa and while it cuts bright stones it lacks that andradite "kick." I agree with Miss Pat & Miss Rockjunquie! Nice work Michelle. 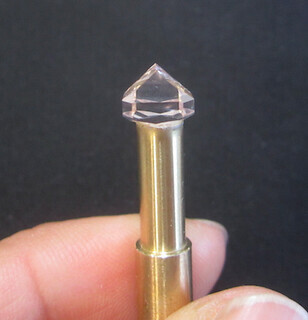 I too have thought about trying faceting, but I'm sure that will be waiting for some time. Guess it's on the bucket list lol. 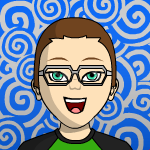 Be sure to post updates. The gem looks great already! I figure this transferring first stone will be quite an interesting challenge, since my approach to dopping cabs is pretty loosey-goosey. The sticker shock is rather high, but no better time than now, while I'm still young and foolish and kid-free. Thanks for the comments on the rough. The morning after, I was a little worried that I had made a poor impulse buy. 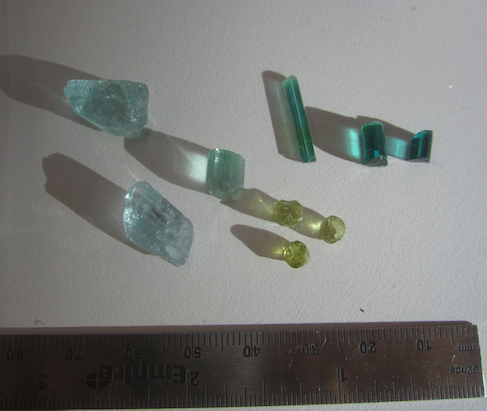 I did know enough to check for open C-axes on all the tourmalines. I believe (rather, I hope) you are right about the Mali garnets. I first looked at them because the seller had some very tiny faceted stones. 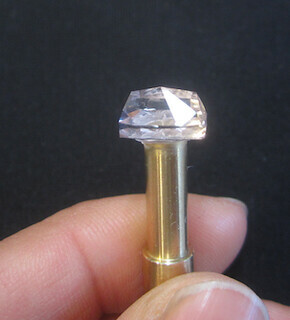 One, that weighed in at a hefty 0.02 ct, was so brilliant despite its size that I thought it was diamond. He was 80% sure that they were cut from the same rough (it was his uncle's material that he inherited). But, the proof is in the cutting! 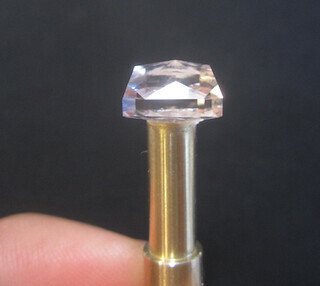 Open C on tourms is a must for faceting. Even when open you can get some unpleasant cross-colors. I've cut a lot of Mali garnets and the shape of your rough is pretty typical. This image is some of my own rough. Color varies depending on the proportions of grossular to andradite and other minor factors. all in short supply around here. I wanted to buy it just because it was mechanically antiquitish. with attention & experience a person could turn out some really nice gems from it. I starting a class on faceting next week at my rock club next week I had my orientation this week looks like a challenge. KI6JUV/ Avatar is in mineral king Sequoia NP. [email protected] Nice work michelle! I vote michelle rookie of the year! Watch for auctions and at rock shows; they are available. It is easy to learn, and the old stuff (like mine), are very easy to use. If things are straight and tight, then it is all about repeatability (sp? ).